Large speakers are known for producing a big sound, but this is usually at the expense of calling attention to themselves. That is, one is always aware that the sound is emanating from a speaker. Remarkably, the Sadurni Staccato disappears as a sound source, to an extent I did not think possible. They cast a wide and deep soundstage, with tight imaging, which further add to the illusion of hearing a life performance. I attribute this to both their excellent crossover design, and to their time alignment. Returning to the issue of dynamics: Though most horn speakers have excellent dynamics, the Sadurni Acoustics Staccatos distinguish themselves by virtue of a particular aspect of dynamics that I refer to as “power.” To be clear, power is not the same as the ability to play loud, though to be sure the Staccatos can do so; in point of fact, they can play at ear-damaging levels, and with remarkably low distortion. To understand power, think of a little 4-banger and a large V8. Both can easily cruise at 60, but the 4-banger is straining, while the V8 has obviously has plenty of—power—in reserve. So it is with speakers. The reason many commercial horns run out of steam is because they are actually “hybrids,” by which I mean they use horns only for the treble and (upper) midrange, but “conventional” designs, i.e., bass reflex, sealed box, or transmission line for the lower mids and bass. In contrast, the Staccatos have an upper bass horn which arguably is the most important part of the speaker. It must be kept in mind that this remarkable horn covers the frequency range from about 125 to 600 Hz, and thus plays well into the midrange; it would be equally accurate to refer to it as the lower midrange horn. Music has considerable energy in the lower midrange and below, and it is this region—not the lower bass, as many think—that provides the foundation for music. The Staccatos’ power in this region, though certainly not only in this region, is a critical part of the magical way it imparts a life-like energy to music. It provides immediacy and “punch” that non-horn speakers can only dream about. To show off this aspect to visitors, I often use a drum solo. One of my visitors is a drummer who used to play with a moderately successful rock band; when I saw his reaction, and then heard his comments, I just smiled. When it comes to power, punch, and immediacy, the Staccatos are the real deal. Large speakers are typically a trade-off; while they can player louder and deeper than their smaller brethren, they lack the latter’s finesse. Not so the Staccatos. Despite the upper bass horn’s sheer power, it—along with the turbine horn– also has extraordinary detail and finesse. This combination of traits is extremely rare. If upper bass horns are so important, why do so many designers omit them? The explanation is that they present a number of logistical problems. First, as the size of the horn goes up, so does the cost and difficulties of shipping. Second, the larger the horn, the more space it occupies in the end-user’s room, and the greater the likelihood of spousal discord. Furthermore, if the horn is too large, it will not fit through doorways. It is for this reason that the mouth and throat sections of the Staccato’s upper bass horn are built as two separate parts, and must be assembled together. But Jorge would not compromise; the vision he had for the Staccatos required a large upper bass horn, and he knew that nothing could substitute for the real thing. In point of fact, Jorge would have liked to have made the upper bass horn even larger, and thus able to reproduce music even farther down the frequency range. This however presented yet a third problem, in that it would have entailed raising the turbine and tweeter horns well above ear level. Jorge was thus limited to a horn that goes down only to about 100 Hz. Before I get to his approach for handling frequencies below 100 Hz, I want to digress for a moment and discuss alternative approaches to upper bass horns. The most common approach is to simply omit the upper bass horn entirely—what I described earlier as a “hybrid” design—in which tweeter and midrange horns are used in conjunction with conventional woofers. While this approach saves space and money, it pays a steep price in performance. An alternate approach is to use a folded bass horn, which was to the best of my knowledge invented by Paul Klipsch for use in his Klipschorn. While this approach can yield enjoyable results, it is not in the same league as the Sadurni Acoustics Staccato’s upper bass horn. In fact, not even close. Presumably because of distortions generated as the sound traverses the folds, such designs lack the immediacy of the Staccato’s front-firing horn, as well as the latter’s detail. This is not intended as an indictment of folded horns; each designer has both size and monetary restraints, and the folded horn is a reasonable compromise, one that is almost always better than no horn at all. But make no mistake; such designs are not in the same league as the Sadurni Acoustics Staccato upper bass horn. Jorge is certainly not the only speaker designer to use large, front-firing upper bass horns. However, of those I’ve heard, Jorge’s ranks amongst the best, a result of his use of MDF, and exquisite attention to detail (including time alignment). Let’s turn now to the lowest octaves, those below 125 Hz. This frequency range presents the largest problem to designers, both literally and figuratively. A true horn that goes down to 20 or so Hz would be larger than a typical refrigerator. Pesky physics, once again. Some manufacturers—Avantgarde Acoustics, for example—do make huge bass horns, for customers who have the budget and size for them. Dr. Bruce Edgar used to make one as well, for use with his Edgarhorns. Jorge felt that this would severely limit the potential customer pool, so he had to find an alternative. Logically, he first tried conventional subwoofers; not surprisingly, they could not keep up with the upper bass horn. As an aside, if a traditional subwoofer can keep up with an upper bass horn, it suggests that the upper bass horn is severely compromised. He therefore had no choice but to design his own low frequency speaker; after numerous attempts and much refinement, Jorge settled on the subwoofer modules, the design of which was described earlier. I should mention that even in my large room, the standard two-tubes-per-side were more than adequate. In fact, my room became overloaded long before the subwoofer modules began to break a sweat. So unless you live in a palace, or stadium, it is unlikely you will need additional woofer modules. To properly blend the subwoofer module with the upper bass horn, it is necessary to adjust the former’s volume and phase, which is easily accomplished with the Behringer active crossover. I’ve had other speakers in my room in which the lowest octave was adjustable. Typically, I have not heard significant effects from changing the phase. With the Staccato’s however, the effects were quite apparent, a result of the speakers’ extraordinary resolution. So here too, the efforts will reap significant rewards. In my room, we did not have to alter the woofer modules’ positions or orientation, though in other rooms this may prove to be critically important. Be prepared to experiment. As is always the case, the deeper and louder the bass, the more potential problems are presented by the room. Physics never goes on vacation. Once properly adjusted, the woofer modules had the same superb properties as the lower mids/upper bass, namely, they were fast (incredibly so), dynamic, powerful, detailed and articulate. The sound was the antithesis of one-note bass, in that each note was distinct from the others. Properly done horn bass–as one hears from the Staccatos–is better than virtually any other bass reproduction. As is typical for high-sensitivity horn speakers, the Sadurni Acoustics Staccatos are an ideal match for low-powered tube amps, including the most flea-powered SET amps. However, those readers who attended shows saw and heard what probably seemed an unlikely pairing: the 110 dB sensitive Staccatos being driven by the 400 W (into 8 Ohms) Merrill Audio Veritas monoblock amplifiers. Allow me to explain how this relationship came to be. When Jorge first came to my home to set up the Staccatos, we began by using my KT88-based, 30 W/channel Tube Distinction Soul monoblock amps for the horns. 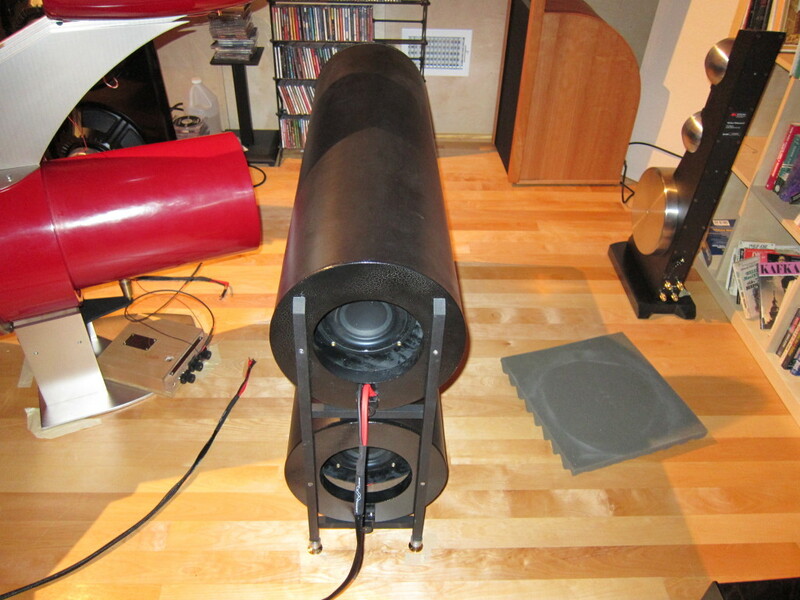 For the subwoofer modules we used a Crown amplifier he was interested in testing. The results overall were quite good, and Jorge was pleased. I was ecstatic, as the Staccatos came to life in my room in a way they hadn’t at shows. Because I owned the Veritas amps (four monoblocks to be exact, as I used them to biamp my Sanders Sound electrostats), I suggested trying them on the subwoofer modules. While I had no doubt that the Veritas were in a different league from the Crowns (as are their prices), in truth I didn’t expect to hear an enormous difference; after all, we would be using them only from about 125 Hz and below; the Soul monoblocks would still be powering the three horns. But there was no harm in trying, and Jorge was game, so I powered off the system, swapped in two Veritas monoblocks for the stereo Crown, re-powered it up, and hit “PLAY.” Before I could ask Jorge what he thought, he exclaimed that he had never heard the bass on his speakers sound that good. Indeed, the difference was quite remarkable. So we both learned something that day; even for frequencies below about 125 Hz, the better the amp, the better the bass. It also reinforced something I already knew: The Veritas are superb with bass, a result–at least in part–of their very high damping factor. While I give the highest recommendation to the Merrill Audio Veritas amps for the subwoofer modules, I am aware that their $12,000 price tag may be a difficult—if not impossible—pill for many to swallow, especially as another amp is needed to power the three upper horns. My suggestion is to try a number of amps for the subwoofer modules, and to not limit the search to the cheap-but-powerful amps that are often assumed to “be good enough” for subwoofers. This effort will be rewarded. We continued to listen to that configuration (Soul monoblocks for the horns, Veritas monoblocks for the subwoofer modules), both of us extremely pleased with the sound. Because I had two more Veritas monoblocks, and because I knew how good they sounded with a variety of speakers, I suggested trying them on the horns as well. Truth be told, my expectation was that we would be impressed that they didn’t sound awful, but would immediately revert to the KT-88-based Souls. Though Jorge had heard his speakers with a variety of amps, all were tubed, and all low powered. But to his credit he kept an open mind and agreed to giving it a try. So I again powered down the system, substituted two Veritas monoblocks for the two Soul monoblocks, powered it up again, and hit “PLAY.” Incredibly, it didn’t sound bad. In fact, it sounded good. Actually, it sounded damned good! After listening for a while I suggested that we turn the tweeter down 1 dB; even the broad bandwidth Soul monoblocks don’t have unlimited high frequency extension like that of the Veritas. In fact, few amps do. This made things even better! We switched back and forth a few times but ultimately agreed that the horns sounded great with the Veritas, which I attribute to the Veritas’ amazing speed and low distortion. The next day I invited Merrill Wettasinghe of Merrill audio to drop by to hear the Staccatos. Needless to say, he too was taken with the way they sounded while powered—top and bottom—by the Veritas, and so he and Jorge decided to share a room at various shows. It is not my intention to suggest that the Sadurni Acoustics Staccatos require the Veritas or another high-powered amp for the horn section, as they (the Staccatos) sound superb with lower-powered tube amps as well. The beauty of the Staccatos is that they will work with a wide variety of amplifiers, of various topologies. But given the Staccato’s extraordinary resolution, the better and faster the amps, the better the resulting sound. You are probably wondering what this has to do with audio. Just like evolution of species, improvements in our system tend to occur slowly (thankfully, not as slowly as actual evolution), with a tweak here and a tweak there. However, at certain times we experience dramatic changes that are almost transformative, akin in my admittedly somewhat far-fetched analogy to the formation of a new species. Having the Sadurni Acoustics Staccato speakers in my listening room has been such a transformative event, as they brought musical to a new level, one I did not think possible within the confines of a stereo system. From top to bottom, the Staccatos excel. They are big when the music is big, delicate when the music is delicate, and everything in between. They have extraordinarily low levels of coloration, and truly allow one to hear deep into the music, and to experience its emotional content on a very deep level. It might seem crazy to say that $40,000 for a pair of speakers can be a bargain, but that is precisely what the Sadurni Acoustics Staccatos are. I have heard competitors’ products that cost close to twice that amount, and they cannot hold a candle in comparison. Anyone in the market for a speaker in this price range, and who has the space, should audition the Staccatos before purchasing anything else. And those who are not fortunate enough to be in such a lofty market, should listen to them just to realize what is possible. I take my hat off to Jorge Sadurni; his vision, hard work, and devotion have yielded a truly state-of-the-art speaker.